“A physician who fails to enter the body of a patient with the lamp of knowledge and understanding can never treat diseases. He should first study all factors, including the environment, which influence a patient’s disease and then prescribe treatment. It is more important to prevent the occurrence of disease than to seek cure.” This is a quote from Acharya Charak, found in Charaka Samhita. Charaka (or Caraka) is widely known as the Father of Indian Medicine and the author of the compendium in Ayurveda, that bears his name (Charaka Samhita). This compendium’s origin can be traced to the great sage and physician Atreya (date unknown), which was later revised by Agnivesa in 8th Century BCE. There were other versions written by renowned physicians, in succession, Bhela, Jatukarna, Parashara, Harita and Ksharapani. It was the version that Charaka wrote after these eminent physicians that remains the basis of the indigenous Indian Medicine, the Ayurveda. His compendium was later revised by Dridhabala in 6th century CE. Dridhabala added 17 chapters on Chikisa sthana and he added Kala sthana and Siddhi sthana new to the compendium. "The physician must provide the knowledge and coordinate the treatment. He must display compassion, cheer and confidence. The physician must seek consent before entering a patient’s quarters, must be accompanied by a male member of the family when attending to a woman or child. He should never indulge in extortion or enter into business activities with the patient. He should speak with soft voice and never use cruel words. Also, always maintain patient’s privacy." Charaka also describes in detail the appropriate circumstances, tone and maintenance of privacy when another physician is consulted in the care of the patient. These codes of behavior are reminiscent of the Hippocrate’s Oath that modern physicians take. 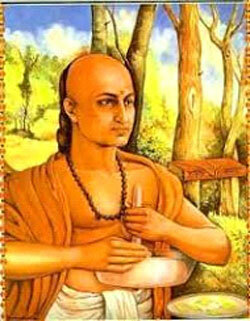 However, it is worthwhile to consider that Charaka’s “Oath” is at least two centuries older than that of Hippocrates. “Take a measure of sesame seeds. Apply mild heat to the vessel. Let vapors from heated milk slightly boil the sesame past.